Barons has some impressive early entries for its September sale, featuring 100 Years of the Spirit of Ecstasy, at Sandown Park on September 20th. 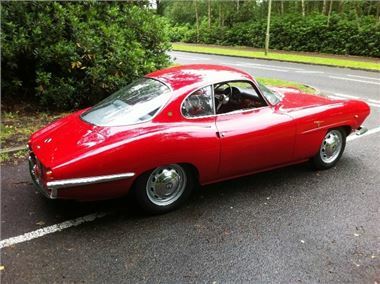 Heading the list to date is a 1962 Alfa Romeo Giulietta Sprint Speciale - possibly the best Giulietta SS in the UK. The owner conducted a 10-year search to find the best example he could, and this car is highly original, totally rust-free and beautifully presented, with just 40,000km from new. The gleaming red body, with its stunning futuristic styling by Italian coachbuilder Bertone, is a real head-turner. Estimate £40,000-44,000. Also, a 1974 Jaguar E-type V12 Commemorative roadster, and there is also a very important Triumph TR2 – originally used as Triumph’s press and marketing car. The E-type is one of just 50 limited edition models built to mark the final production of this quintessentially British sports car. This exceptional and highly collectable machine is in outstanding condition, in black with cinnamon hide upholstery, and it is hard to think of a better example anywhere in the world. It carries an estimate of £145,000 to £165,000. The 1954 Triumph TR2 on offer was used by Triumph as the factory press and marketing car throughout 1955. Consequently PHP 727 played an important role in Triumph’s most prolific sales year of the period. It also featured in 'Motor' magazine and in Bill Piggott's book ‘Triumph by Name, Triumph by Nature’. It is presented in superb condition and carries an estimate of £30,000-£34,000. Early Rolls-Royce entries include a rare and beautiful 1967 Rolls-Royce Mulliner Park Ward two-door saloon, said to have been in the same family since 1972, and part of a private collection in California for some time. It is offered complete with all of the original owner's manuals, a copy of the factory build sheet, the original colour chip sample booklet and full toolkit. Estimate: £17,000-19,000. Further Rolls-Royce and Bentley entries are invited. A little further down the price scale but no less impressive in terms of condition is a 1968 Triumph 2000 MkI. Originally destined as an export model to Bermuda, this car was specified with all the available options that Triumph could muster, including a full Continental touring kit. It has had just three owners from new, and comes with bills for approximately £50,000. Stunning in all respects, it is probably unique in this condition. Estimate £7,000-9,000. For further information or to consign a car to the sale, please visit www.barons-auctions.com, email info@barons-auctions.com.